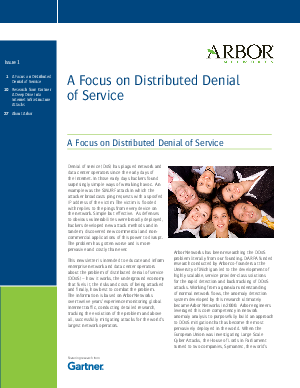 This newsletter is intended to educate and inform enterprise network and data center operators about the problem of distributed denial of service (DDoS). – how it works, the underground economy that fuels it, the risks and costs of being attacked and finally, how best to combat the problem. The information is based on Arbor Networks over twelve years’ experience monitoring global Internet traffic, conducting detailed research, tracking the evolution of the problem and above all, successfully mitigating attacks for the world’s largest network operators.